David Berlin is the founding editor of The Walrus and author of The Moral Lives of Israelis: Reinventing the Dream State. Last November, the Israeli media were busy covering a spate of serious allegations of corruption in Jerusalem that reached right to the top. Television viewers were inundated with images of Omri and Gilad Sharon, Prime Minister Sharon’s two rather obdurate sons, who were valiantly trying to stave off accusations that they had played a part in various million-dollar campaign-financing capers involving their father. The Sharons’ shenanigans occupied only one ring of this media circus. The deputy prime minister, Ehud Olmert, was also under suspicion for taking a bribe; Naomi Blumenthal, the deputy minister of infrastructure, was charged on several counts of bribery; and Amram Mitzna, the former mayor of Haifa and one-time leader of the Labour Party, was alleged to have received money under the table from a contractor. The list went on. Yet driving along the serpentine Ayalon freeway, or sipping arak in a crowded bar on Hayarkon Street in Tel Aviv, or shopping in an open-air market in Beer Sheva, I found it hard, at first, to imagine what Burg might have meant. There is a superficial air of normality about the country. The al-Aqsa intifada, triggered when Ariel Sharon took his famous walk on the Temple Mount in September, 2000, is now well into its fourth year and there have been more than a hundred suicide bombings that have claimed almost a thousand lives. 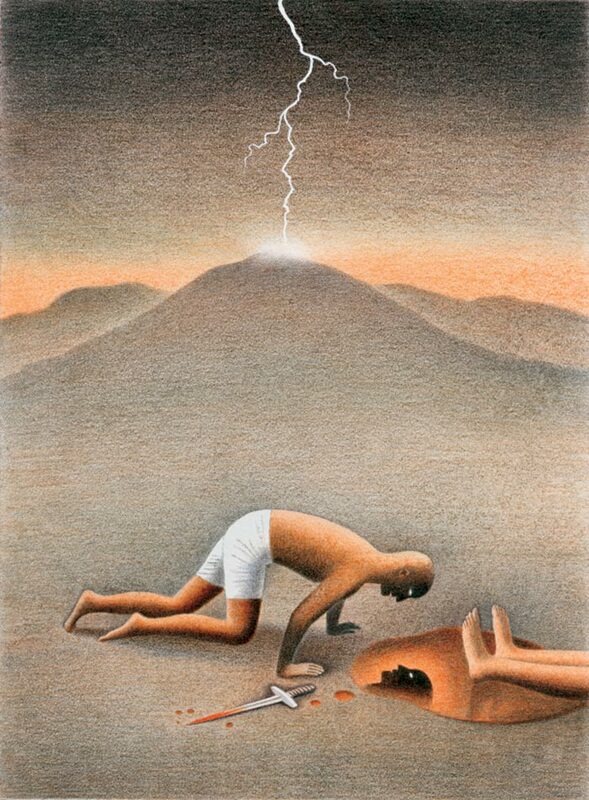 But most Israelis have learned to treat this omnipresent danger as some sort of natural cataclysm, akin to living on the slopes of an active volcano. In the beginning, each new bombing would dominate the news and preoccupy the country for days at a time; now Israelis are more likely to learn of fresh attacks from a news-crawl across the bottom of their TV screens. Bomb sites are quickly cleared of debris and victims, and life is returned to a semblance of the routine in record time. This does not mean, however, that the intifada is having a diminishing impact on Israeli life, only that it has retreated to a deeper, less visible level where it can wreak havoc on Israeli culture from the inside. You sometimes catch glimpses of that impact—and then only indirectly—in the impatience and nervousness of just about every Israeli you meet, in the hyper-aggressiveness of the young, or in the palpable denial in the air. Many Israelis, for instance, appear to have convinced themselves that the terrorist attacks have nothing to do with them or with the actions of their government. They point to September 11 and to Al Qaeda’s attacks in Afghanistan, Africa, and Turkey as proof that terrorism is a world-wide phenomenon—part of the clash of civilizations, so to speak. The very randomness of the attacks, some Israelis told me, have persuaded them that terrorism in Israel is simply the price they have to pay for being a free society. Yet for all that, the morale in Israel today is probably at its lowest ebb since 1973, when Defence Minister Moshe Dayan considered deploying nuclear weapons midway through the Yom Kippur War as a last-ditch effort to save the nation. Another factor in the general malaise is the severe downturn in the Israeli economy. For one thing, huge sums are being spent on the defence of tiny, zealous communities like Hebron, Bet El, and Ofra that have dug themselves into the occupied territories, even as thousands of public- and high-school teachers have lost their jobs. The Israeli education system, once the pride of the nation, has slipped into free fall. It is not only that class sizes have grown, with a corresponding decline in the quality of education; the ideological foundations of the education system keep shifting as well, undermining what little sense of progress there once was. During the final months of Prime Minister Rabin’s tenure in 1995, the Labour government commissioned a host of new history books that were meant to retell the founding mythology in a manner that would make it easier for Israelis to live with their Arab neighbours. The books were written but never included in the public-school curricula, and the net effect was not only a loss of direction, but a sense that some potential opening to the future was closing down. Unemployment in Israel is approaching 11 percent and climbing rapidly. This time around it is the middle class—architects, engineers, lawyers, accountants, musicians, the skilled tradespeople—who are hardest hit. For a small country such as Israel, this is particularly problematic because out-of-work Israeli professionals tend to seek opportunities abroad. The German embassy in Tel Aviv has entertained so many visa applications that it is no longer prepared to make the numbers public, presumably so as not to embarrass the Israeli government. The gap between the very small percentage of wealthy Israelis and the far larger pool of lower-income people is now wider than in any western country. A recent study shows that infant-mortality rates in the poorer south Tel Aviv-Jaffa district are three times as high as in wealthier north and central Tel Aviv, facts that shock many Israelis who believe that the original medicare system is still working. And it goes without saying that tourism and the high-tech industry, yesterday’s pillars of the Israeli economy, have collapsed. A mere four years ago construction was booming in every region. Now one routinely comes across abandoned shells of new industrial complexes and office buildings that betray the signs of sudden bankruptcy. Even Israel’s high culture—the plastic arts, music, theatre, and literature—has become rather more nostalgic and sentimental than visionary. Artists these days seem either hooked on the past or obsessively and safely trendy. Seldom does one hear or see or touch anything that points toward the future. To be sure, the situation among the Palestinians living in the West Bank and Gaza, in the hollowed-out towns of Jenin or Qalqilya, or among the listless and angry youth at Israeli checkpoints, has deteriorated even further. The fact is that on both sides of the eight-metre-high fence snaking in and out of the Green Line that marks the pre-1967 borders of Israel, people seem caught between the will to live and hopelessness. The situation is desperate, and desperate times call for desperate solutions. The most recent—and I would argue the most hopeful—of such solutions is a citizens’ initiative called the Geneva Accord. Calling for a separate Palestinian state in almost all of Gaza and the West Bank, with Jerusalem as the capital of both Israel and Palestine, it was unveiled last November to mild fanfare and virulent criticism. Despite widespread coverage and a high-profile “launch” in Geneva on December 1, it is still unclear whether the accord will sink without a trace, or go on to become the long-awaited breakthrough. But to appreciate the sheer audacity and courage it took to come up with such a plan in the first place, we first need to sort through the wreckage of earlier efforts. Ever since the formal recognition of the State of Israel in May, 1948, the conundrum created by the existence of a Jewish homeland set in the middle of Arab territory has defied the best efforts of generations of statesmen, soldiers, and politicians to resolve it. In the past decade alone, agreements tabled in places such as Madrid, Oslo, Taba (in Egypt), and in the American presidential retreat of Camp David, have floundered and failed. The current plan on the table, the Bush administration’s Road Map, appears to be leading nowhere as well. The ultimate aim of all these efforts has been to come up with a way to create an independent state for the Palestinians that can coexist peacefully alongside the state of Israel. This solution, the so-called “two-state solution,” is still closest to what the great majority of both Israelis and Palestinians want. It is predicated on resolving five major areas of contention: where the borders of the two states will run; how the fate of Jewish settlements in the occupied territories is to be handled; how Jerusalem is to be administered; how the more than three million Palestinian refugees are to be resettled; and what role the international community will play in supporting and, if necessary, enforcing any eventual agreement. Each of these areas is so enormously complex that none of the accords so far have been able to proceed much beyond agreement on general principles, sets of preconditions that, ultimately, have blocked rather than facilitated the peace process. Agreements such as Oslo or the Bush Road Map, precisely because they require a practically non-existent commodity—good faith on both sides—have so far proved untenable. But there are even more serious problems underlying the two-state solution, problems that may well defy any formal solutions. For example, there is the question of how ready the Palestinians are to govern themselves. Many Palestinian thinkers, including Dr. Mustafa Barghouti, founder and director of the Health, Development, Information, and Policy Institute in Ramallah, suggest that Palestinians do not yet have the civic culture to sustain a sovereign nation. In an interview Barghouti gave to the Cairo-based newspaper, Al-Ahram, last July, he underscored the gap between the Palestinian Authority and Hamas, a gap that could undermine the possibility of a meaningful, unified central government to run the new entity responsibly. Dr. Barghouti has called for genuine domestic reforms that would solve problems of lack of accountability among the Palestinian leadership, encourage the capacity for independent decision-making, and support free elections, with the participation of women and the young. He’s optimistic that Palestinians can accomplish all of this in time, but he’s unwilling to postpone the creation of a Palestinian state while Palestinians acquire the skills to run it. This absence of a culture of accountability among the Palestinians worries the Israelis too. A senior officer in the Israeli security service told me that among his military concerns is the possibility that in the event of partition, the leader of the Hezbollah forces, Sheik Hassan Nasrallah, currently headquartered in Lebanon, would make his way into Palestine to recruit a new army whose sole raison d’être would be the destabilization of the entire region. Palestinians, for their part, worry about Israeli self-restraint, and well they should. During the last federal election, the former leader of the Labour Party, Amram Mitzna, campaigning on the two-state solution, argued that living next to a sovereign Palestine could save the lives of Israeli soldiers. In the event of a suicide attack, Mitzna explained, rather than sending in ground troops, Israel could respond with the full might of its air power. It is hardly a scenario in which Palestinians could find much comfort. Clearly, any imaginable agreement would still demand large reservoirs of good faith and a tactful overlooking of the real problems and limitations of both sides. At the moment, unfortunately, good faith, like water, is in very short supply in the region. The “threat” underlying the one-state solution, and the main reason why, in the short term, it has no hope of working, is what is often euphemistically referred to as “the demographic problem.” This refers to the very real possibility that the three and a half million Palestinians currently living in the West Bank and Gaza might lose interest in attaining a sovereign state and seek annexation, or be forcefully annexed, by a right-wing Israeli government. Should this population then gain equal rights, including the right to vote, and join forces with the more than one million Israeli Arabs currently residing east of the Green Line, the consequences for Israel could be devastating. The Palestinians know this, which is why some factions of the Tanzim, the Fatah’s paramilitary wing, are thinking of taking their struggle in precisely this direction. Tanzim’s leader, Marwan Barghouti, speaking at the closing session of his trial in an Israeli courthouse last September, declared that if Palestinians do not get a state of their own then the only remaining solution is a single state for the two peoples. In November, Ali Jerbawi, a prominent Palestinian political scientist, went so far as to say that if Israel did not agree to a Palestinian state within six months, the Palestinians should demand immediate annexation. Because this scenario could give the Palestinians the upper hand and effectively kill the Zionist dream of a Jewish state, it scares the living daylights out of most Israelis. For at least three reasons, I now believe the one-state model should be abandoned. In the first place, the “undeclared binationalism” under Sharon is untenable, unjust, and a recipe for perpetual conflict. In the second place, a hefty majority wants to go with the two-state alternative, which makes it impossible for any government to endorse a single-state solution. And thirdly, the annexation of the territories would inevitably lead to a hardening of attitudes along fundamentalist lines. In short, pushing for a single state could well lead to scenarios that are far worse than those imaginable under a two-state solution. It also seems to me that Israeli one-staters have yet to take themselves and their alternative very seriously. To do so they would have to provide hard answers to hard questions. Who would control and serve in the army? How would taxes be collected and apportioned? Where would synagogues and minarets be built and where would religious institutions be prohibited? What flag, what calendar, what justice system, what health-care system, what kinds of schools and what dress codes would be legislated? So far, most of these questions have scarcely been raised, let alone answered. And yet there are still two good reasons not to dismiss altogether the vision of a single, secular state. In my view it is, paradoxically, the only model that has currency over the long term. I believe that any partition that separates Israelis and Palestinians needs to proceed with the outside possibility that one day, perhaps only after this desert generation dies and is buried, the walls will come down and the land that the Zionist thinker Tabenkin thought could never be divided will in fact grow together in some real and organic fashion. A less dreamy way of stating the same thing would be to say that any partition plan should be understood as an interim agreement, a mere separation and not a final divorce. The more pragmatic reason for keeping the single, secular-state option from fading is that separated, Israel and Palestine would be two ethno-religious entities—a Jewish and an Arab state. And such entities are, by definition, undemocratic. This is one reason why thoughtful Israelis worry about losing sight altogether of the one-state solution: it is only through the democratic potential of this alternative that Israel will be able to retain its ideological link with the West. The move away from democracy entailed in the two-state solution would probably go unremarked by the current American administration, but there is no guarantee that the same will hold true for future administrations. It makes sense, therefore, to keep the one-state option alive as a beacon of hope for the future and as a reason, now, to insist that any surgery cut only along demarcation lines that may eventually grow together. Damascus Gate, East Jerusalem, 2003. 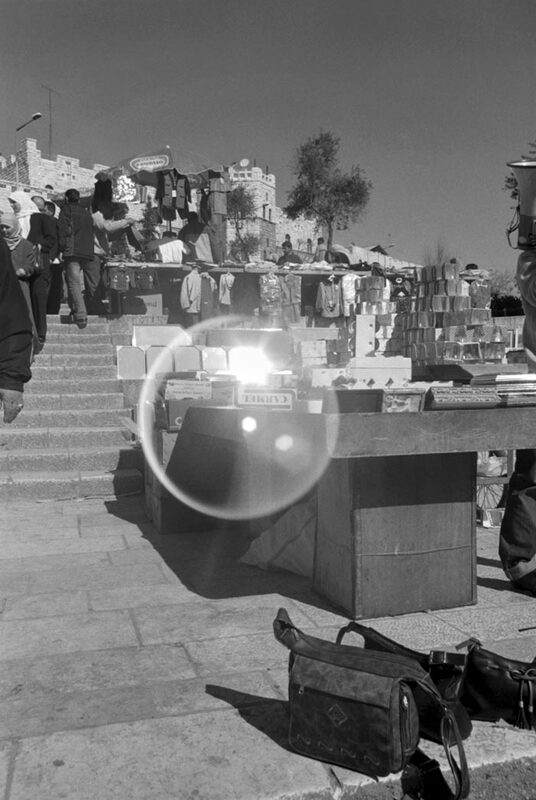 A soap bubble floats in the air past the Damascus Gate entrance to the Arab Quarter of the Old City. One of the few times I felt the limnings of hope on my visit to Israel in November was during a lengthy conversation with a slight, fifty-two-year-old Orientalist and professor of political science at Bar-Ilan University, Dr. Menachem Klein. Klein lives in Bak’a in Jerusalem and he is an expert in that city’s labyrinthine topography. In 2001, he joined a team of negotiators headed up by the former Israeli Justice Minister, Yossi Beilin, and Arafat’s former Information Minister, Yasser Abed Rabbo. They spearheaded a citizens’ initative, later called the Geneva Accord, to complete the Clinton-sponsored Taba negotiations that were smothered by what Klein calls the “wholly avoidable” intifada, and then snuffed out entirely by the February 2001 election, which Barak lost to Ariel Sharon. As Klein tells it, the initiative began at a conference where Yossi Beilin met the Swiss political scientist Alexis Keller. Beilin had served as Barak’s chief negotiator in Taba and he had always retained the hope that, had Taba gone into its “8th day”—in other words, had it been allowed more time—there would have been a settlement. Keller was moved by Beilin’s convictions, and decided to fund the first stages of that unfinished business. Lots of money was in fact needed. The Palestinians could not get permission to enter Israel and the Israelis could not travel to the West Bank. The team had to convene in Jordan or London or Switzerland. They had to hire statisticians and land surveyors, acquire aerial photographs and maps of villages that were no longer in existence. Last November, when the agreement was completed, Beilin oversaw the production and distribution of more than two million copies of the Accord, one to every household in Israel and, where there was postal service, to homes in the occupied territories as well. As I listened, I found myself growing more and more excited. It felt like the thing both Israelis and Palestinians had been dreaming about for decades. Though the conversations began warily, the first big breakthrough came when both teams agreed to take, as their common point of departure, UN resolutions 242 and 338, which called on Israel to withdraw to its pre-1967-war borders. “Had the Palestinians demanded that we begin with the situation we had in 1948, we could have got no further,” Klein said. Before coming to the table, the Israeli team had decided not to negotiate over the Israeli settlements inside Jerusalem proper—the townships of Gilo and others. This reduced the number of settlers who could, theoretically, be uprooted to approximately 200,000 of the 400,000 that a return to the 1948 status would have produced. “We had it in our mind that no more than fifty percent of those, or just over 100,000 settlers, could and should be uprooted,” Klein said. “Any more than that would invite a political nightmare and would scuttle the whole agreement.” The Palestinian team agreed. In all cases, the negotiators operated under a strict one-to-one swap, so that every inch of expropriated Palestinian land was exchanged for an inch of land inside the Green Line. Perhaps the most interesting land swap would occur around the Palestinian-controlled Gaza Strip, which in the final Geneva maps appears to have increased by about twenty-five percent. Land belonging to the Israeli kibbutzim to the east of the Gaza Strip would be transferred to the new state of Palestine. The Accord also calls for all buildings and infrastructure affected by the agreement to be turned over to the Palestinians intact. Klein told me that the teams were able to avoid the problem by cutting straight to the chase—to the real human problems of Palestinian refugees. In the final document, the term “right of return” has been excluded. They formalized the final draft of that part of the agreement in less than two hours, in a video teleconference, with the Israelis at the Crown Plaza in Tel Aviv and Abed Rabbo and his team, along with the Swiss, in Ramallah. Each of the three million Palestinian refugees would be provided with several options, including the choice of staying where they are, in exchange for monetary compensation, or emigrating to a third country such as Canada. Approximately 30,000 refugees would be reintegrated into Israel. In principle, Beilin said, Israel retains its right to accept or deny any individual refugee application. But the terms of the Accord stipulate that Israel must integrate a number of refugees equal to the average accepted by individual participating countries. If Israel were to refuse, it would be in violation of the agreement. When the Accord was officially released in Geneva on December 1, the Sharon government lashed out as expected, calling it subversive and “rogue diplomacy.” Crowds of Palestinians tried to prevent the Palestinian negotiators from flying to Geneva for the ceremony until Arafat called them off. The American columnist Charles Krauthammer called it scandalous and denigrated the credentials of the main players. Michael Oren, a senior fellow at the Shalem Center in Jerusalem, told me that had this happened in the United States, the negotiators “would have been charged under the Logan Act of 1799”—an act that prohibits American citizens from negotiating with foreign governments. Most of the press, however, failed to note what seems to me the most important point about the Geneva Accord: it was a citizens’ initiative. The idea that citizens have the right to step in where their governments fail runs deep in our notions of democracy, and has found new forms and occasions in the human-rights movements behind the political upheavals that swept Central Europe in 1989, and most recently in places like Belgrade and Tbilisi. A group of concerned citizens who are not constrained, as politicians are, by the radical dreams of their constituents, can often see solutions where governments cannot. And if their ideas are right, if the solutions they propose are sound, these ideas will take on a life of their own and spread, despite the best efforts of their opponents to stop them. Even if they go no further, the Geneva Accord has shattered once and for all the myth that Palestinians and Israelis cannot talk to each other, cannot find common ground, cannot agree on a way to create two separate, neighbouring states that can coexist without constantly lunging at one another’s throats. Much remains unresolved: so far, with the exception of the newly formed Ya’ad party, no major political party has yet adopted the Accord in its platform; the concessions proposed have already angered the more inflexible constituencies on both sides; inevitably, some fundamental questions remain unposed, in the interest of general agreement. But it is a step in the right direction, and in early December, polls showed that 53 percent of Israelis and 56 percent of Palestinians were willing to consider taking it. Larry Towell won the Henri Cartier-Bresson Award in 2003, and the World Press Photo of the Year in 1993.